SOUTH BEND, Indiana — In the penultimate game of its regular season, the No. 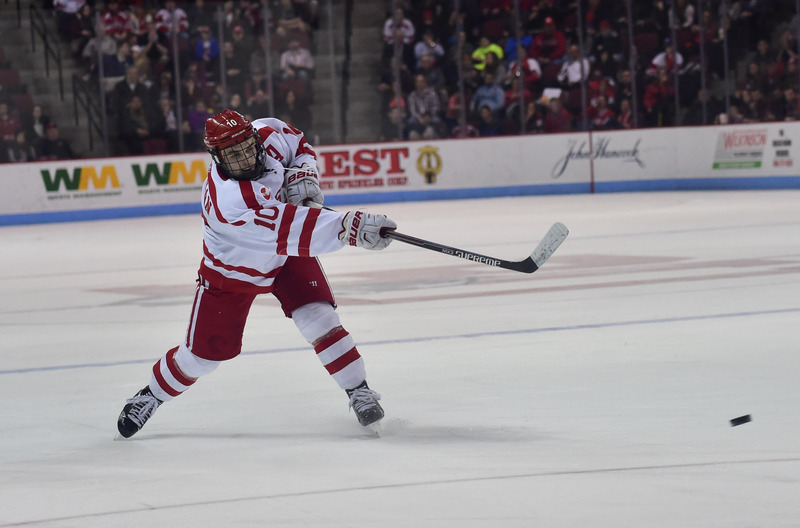 9 Boston University men’s hockey team made what’s to come a little bit easier on itself. The Terriers (19-9-5, 12-5-4 Hockey East) defeated the No. 10 University of Notre Dame by a score of 3-2 in an important conference matchup to help decide where they will officially fall in the standings. They played well in what would be described by BU head coach David Quinn as a playoff atmosphere, and we thought so, too. BU’s second goal of the evening was scored by senior forward Mike Moran, who was back to centering the fourth line as junior forward Robbie Baillargeon returned to the lineup after missing last weekend’s slate with the University of New Hampshire. Moran and his wingers, sophomore Chase Phelps and junior Tommy Kelley, provided an energetic and physical presence on the ice. Andrew has more about this in his sider. Quinn added that this is the time of year when the little things really start to matter. Not that they don’t early in the year, he clarified, but they tend to mean more now. Much of that had to do with the way the Terriers defended throughout the game. Neither of the Irish’s goals came at 5-on-5, and Quinn attributed that to the way BU played its opponent. “I thought we did a really good job of closing on them down low, we were really conscious of our body positioning, keeping our body between the net and offensive player,” he said. “We were quick, our second defender did a good job getting to their second guy, supporting the play, and I thought we were consistent with that. It seems like putting senior netminder Sean Maguire in the pluses category has become an almost weekly occurrence, but he came up big for the team again on Friday. Maguire recorded 33 saves on 35 shots and was named first star of the game, bumping his season save percentage up a couple points from .925 to .927. At 5-on-5, Maguire was perfect, as the two goals he allowed during the evening came at 5-on-4 and 6-on-5. And even with Notre Dame’s extra skater on the ice, the goaltender recorded five saves on six Irish power-play shots and fended off all but one chance during the 2:28 goalie Cal Petersen was pulled at the end of the game. That shot, however, was put in the back of the net a bit at the fault of Maguire, who had flung the puck down the ice at the empty net for what we assume was an attempt at a goalie goal (which would have been awesome), but it missed and wound up being an icing. The faceoff came back to BU’s end, and the Irish benefited from a rebound and bodies in front to pull within one. From there, though, and aside from the other goal Notre Dame scored, Maguire’s positioning and play acted as a brick wall for BU. 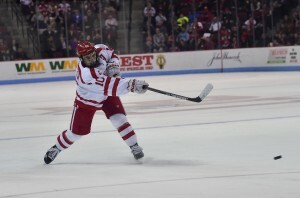 Senior forward Ahti Oksanen and Moran both notched goals in the win Friday, and senior assistant captain Danny O’Regan also registered a pair of assists for four of nine BU points in the game coming from the senior class. Just a quick fun fact, but Friday’s win marked the Terriers’ first against the Irish since Oct. 10, 2010, and, subsequently, their first victory at the Compton Family Ice Arena, which opened in Oct. 2011. Another little tidbit for ya is that with his two assists on Friday night, O’Regan now has 148 career points in 148 career games. Aside from that making him a career point per game player, it also means he has the most career points since Chris Drury had 214 from 1994-98. BU ended both the first and second periods on the penalty kill Friday night, which is less than ideal for sure, especially since the Terriers gave up a goal at the end of the first. This hasn’t really been an issue during the rest of the season, so I’m being a little nitpicky since it’s not a trend, but naturally it’s something BU doesn’t want to and probably won’t continue. I know, I know, it got a goal, but the power play did not look great in its one chance on the ice Friday. BU had trouble with its breakout and could not enter the zone cleanly while operating with the man advantage. It really took until Oksanen’s tally for the unit to generate much of anything at all. Still, a goal’s a goal, and the Terriers now have four markers on their last 11 power plays. We were the most aggressive that I’ve seen the team play since the game against the U-18 team lol. The heavy fore-check disrupted ND’s flow and it seemed like that was the best thing we could’ve done. Good team win and I’m hoping for another one tonight!